Father Hunwicke has a short post this morning that is worth reading. It reminds all of those papolaters out there. He refers to comments by the Dean of the Roman Rota demanding humble obedience as the Spirit speaks through Francis. What "Spirit." The Holy Spirit, the Third Person of the Most Holy Trinity? Why do people continue to ascribe more power to the Pope and more authority than he has? Are they a bunch of Protestants or are they trying to prove Protestants correct that we worship the Pope, kiss his toes and fall down and bow at every word he says? Muslims speak of blasphemy against Mohammad. How is it possible? It is not! One cannot blaspheme against a man. Are we to agree that a drawing of Mohammad is a blasphemy? Is Mohammad God? You can only blaspheme against God. Read this. The. Pope. Is. Not. God. He. Is. A. Fallible. Man! One cannot blaspheme the Pope. My Anonymous friend has proved the very problem and the correctness of this post. The First Vatican Council prescribed the Infallibility of the Pope. We can't tell Protestants what to think but for heaven's sake, can Catholics at least come to understand that the Infallibility of the Pope is a control on his power not an absolute grant of it? "The Pope is not an absolute monarch whose thoughts and desires are law. On the contrary: the Pope's ministry is a guarantee of obedience to Christ and to his Word. He must not proclaim his own ideas, but rather constantly bind himself and the Church to obedience to God's Word, in the face of every attempt to adapt it or water it down, and every form of opportunism." "I would not say so, in the sense that the Holy Spirit picks out the Pope. ... I would say that the Spirit does not exactly take control of the affair, but rather like a good educator, as it were, leaves us much space, much freedom, without entirely abandoning us. Thus the Spirit's role should be understood in a much more elastic sense, not that he dictates the candidate for whom one must vote. Probably the only assurance he offers is that the thing cannot be totally ruined. There are too many contrary instances of popes the Holy Spirit obviously would not have picked!" Do you really think Almighty God elected Alexander VI? “Peter has no need of our lies or flattery. Those who blindly and indiscriminately defend every decision of the Supreme Pontiff are the very ones who do most to undermine the authority of the Holy See - they destroy instead of strengthening its foundations," Bishop Melchior Cano O.P., eminent theologian of the Council of Trent. Do not confuse the active Will of the Almighty with the permissive. They appear to worship Pope Francis instead of Our Lord. These "progressives" have gotten the Pope of their dreams. May God have mercy on them. And you with a Vortex link on your blog. Such hipocrisy. I guess we could throw an oldie but goodie back at the Dean of the Roman Rota: 'the confessor or counsellor must show sympathetic understanding and reverence for the sincere good faith of those who fail in their effort to accept some point*' in regards to 'humble obedience as the Spirit speaks through Francis' and go our merry way. Liberals love to cherry pick their obedience. Tell me Andrew; do you have friends or family whom you may disagree with? I have great respect for Michael Voris and his work. He is my friend and he came to my aid when my back was against the wall. Do you wish me to really be a hypocrite? Andrew T: attack the point and not the person. If Vox is in error point it out. The Father having been rejected in the Garden, the Son in Jerusalem, God's people His Church now in large part rejects the third person, the Holy Spirit. Blasphemy against His Vicar and hardness of heart. This Vox post is another shameful example. Makes me sick. Vox, my friend, I think Andrew T. (above) was wrong to ascribe the word "hypocrisy" to you, but when considered in the wider context of the crisis in the Church, what he is pointing at, inadvertently perhaps, are the mixed signals sometimes noticed at this blog. And I think it all relates to a distinction (or lack thereof) of the public and the personal. Please let me explain, in sincerity, with respect, hoping you won't ban me, allowing this comment to go through (in 3 parts, Blogger comment length restrictions), as I believe what will be written below would be of benefit to your Canadian Catholic readers. This is a Traditional Catholic blog, a fantastic blog it should be added, one I check on regularly, and I am very pleased your blog is now widely known, especially since when that Wolf in Fuzzy Slippers (i.e. 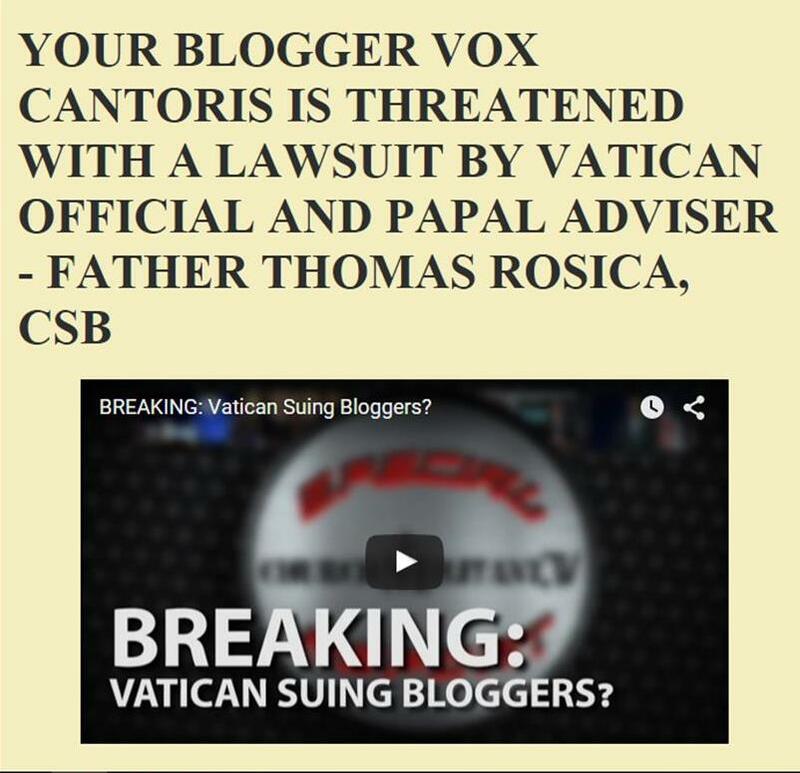 Rosica) attempted to destroy you with legal action, a matter going worldwide on the internet. But notice: Voris/CMTV has, since Francis' election, done a 180 in its programming. Everybody knows this, the evidence is crystal clear. It's indisputable (the reasons for it are another matter, which I will not go into). As a prime example, in true Neo-Catholic-Papalotry form, they are attacking the SSPX as "schismatic", when they are not, in actuality. The attacks are amateurish, unfounded, unqualified, stupid. This is not Traditional Catholicism (i.e. just Catholicism). Yet, I see your dilemma here, and sympathize to a degree. Voris helped you get the word out when the Wolf in Fuzzy Slippers tried to take you down from comments you posted about on statements he made PUBLICALLY. True, that was a good deed done by Voris. CMTV's wide audience/popularity, undoubtedly, had more of an effect in worldwide dissemination than us obscure bloggers. Yet his assistance more so related to the personal, yes? Voris helped when you were experiencing something that was going to detrimentally affect you in a very PERSONAL way, your livelihood, reputation, etc. Yet, as just stated, Voris & Company are lately PUBLICALLY spewing out all kinds of nonsense, sticking their heads in the sand, ignoring Bergoglio's multitudinous heretical expostulations, and so on ad nauseum... and there's the dilemma. You have "The Daily Vortex" on your menu tabs at the top of the blog - so it seems that you are promoting CMTV's agenda. A first time TradCat reader would find this confusing, yes? Hence, Andrew T.'s comment. But I submit this to you, Vox: You would not betray Voris by removing that tab and write critical articles about the BS going on at CMTV. Rather, it would be charitable. Loyalty, first goes where: to fallible, sinful man or to Christ and what His Church has always taught? I think you know the answer. Then there is the case of Fr. Nicholson. Both of us know of his venomous, ridiculous attacks against the SSPX, calling their Masses "Satanic". He also assails anyone who criticizes Francis' blatant, never-ending anti-Catholic, Church-destroying remarks and actions. Just yesterday, in the com boxes at the Spectator blog, Fr. Nicholson besieges probably one of the best journalists at The Remnant/LSN (see blogs.spectator.co.uk/coffeehouse/2015/09/pope-franciss-us-tour-has-been-a-triumph-his-conservative-critics-must-be-in-despair). Yet, again, Fr. Paul Nicholson is on the menu tabs of this Traditional Catholic blog. Mixed signals to readers, yes? Remember, about 1.5 years ago when I defended Fr. Nicholson against that pervert priest in London Diocese, causing quite the dust storm? I understand that one of frolicking princesses at St. Peters Seminary has left as a result, as a consequence of his comments at my blog. Justice is served. But then Fr. Nicholson put his hideous anti-SSPX agenda into full gear, of which I was unaware at the time. Good was done in that a homo-priest was exposed, but this also inferred that I was supporter of Fr. Nicholson's nonsensities, when I am not. It was a dilemma. So, I tweeted Fr. Nicholson and disassociated myself from him, knowing already that any Trad credibility I had was diminished. So be it. Glory be to God. But no betrayal involved in my part against Fr. Nicholson. Again - Loyalty first goes where: to fallible, sinful man or to Christ and what His Church has always taught? Next up is the case of Rosica v. Vox. Sir, you gave your e-mail exchanges with Rosica to Cummings-McLean, trusted her with them, then she writes that piece in CWR, setting up a false equivalency between you and the Wolf in Fuzzy Slippers, "unless the two men reconcile, closure will not be forthcoming " (see www.catholicworldreport.com/Blog/3751/the_priest_vs_the_blogger_a_case_in_canadian_conflict.aspx, insinuating no right and wrong, skewing matters to personal animus, away from doctrinal crisis, setting things up into some Hegelian formula of resolution. The very first commenter on that article caught right away that you were being shafted, and in response to that comment, the kind gentleman from Spain who arranged for Bishop Athanasius Schneider to write to you, agreed. Yet I look at your blog and I see you endorsing Cummings-McLean. Why? Mixed signals, yes? I've debated online with Cummings-McLean for years now. From long ago when I exposed the Modernist cretins at Novalis Publishers right up until recently, she will fight tooth and nail in defending heretics and heresy enablers like Joe Sinasac, Michael Swan, Neo-Catholic celebrities. Conclusion: Trad on the outside, liberal on the inside. Then there is Deborah Gyapong, also at the Catholic Register. In response to your legal matter with Rosica, she blog-gushed, calling for "an appeal for restraint", emasculation, feminizing, saying that the Wolf in Fuzzy Slippers was "opening doors" for her. Poor dear. (see foolishnesstotheworld.wordpress.com/2015/02/24/on-father-tom-rosica-an-appeal-for-restraint/). Then she had the audacity to come to your blog and, like some smug Mother Hen, telling you that you must behave like a good boy now because your blog has now obtained international status. Sickening. Is this someone you can trust? Someone celebrity enamoured, retaining her emotionalistic evangelical Protestant baggage, taking no stand - more Nu-Church relativism. At one time I had hope for the persons mentioned, giving some slack, being patient, but that time is over (still pray for them). The good thing about VulgarFrancisChurch is that everything is emerging from the sludge within. The crisis in the Catholic Church is coming down to the crunch, the Wheat is being separated from the Chaff, and these Professional Catholics are themselves, by auto-reflex, exposing where their true loyalties lie, i.e. nowhere," let's all get along", not taking stands, diverting, ignoring, which means they are indeed taking stands, lukewarm ones that is. And we both know what Christ said about that. I'm done with these types, and so are a lot of other people, I can confirm. It's time to cut the rope, Vox. I'm confident that these people are kind, warm and charming in person, but this is irrelevant. We cannot stick our heads in the sand anymore, even if they are PERSONAL friends, when they are causing so much damage online in the PUBLIC square. They have to be called out. If not, would we then not be guilty of the same crimes, diversions, of sticking our heads in the sand, ignoring the obvious? Once again, my friend, I ask - Loyalty first goes where: to fallible, sinful man or to Christ and what His Church has always taught? I have a link to Mundabor too. That does not mean that I endorse "all" of what he says. Michael Voris is a friend. Father Paul Nicholson is a very good friend. He presided at the Holy Matrimony of Fox and me and we love him. He and Michael along with Dorothy and Deborah have much good to say and to paraphrase the other Fox, "I list, you decide." I don't have to agree with everything that anyone at the links or tabs has to say. All of them are solid Catholics where no heresy will be preached. That is clear. We can disagree on some things. Okay, Vox, it's your site. But for the record - I warned you.